Last September I visited Annapolis, Maryland and walked past these memorial statues on dry ground. Little did I know this flooded scene is their future. We live in an age of rising seas. 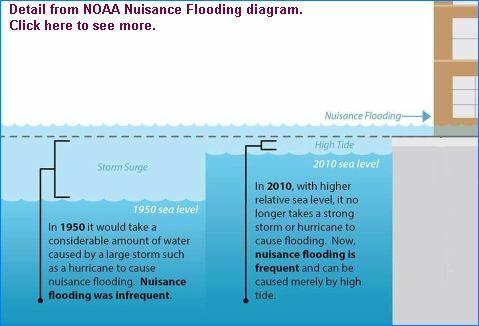 All along the coasts of the United States a continuing rise of sea level has been perceptible on the tide gauges of the Coast and Geodetic Survey since 1930. 66 years later the ocean has risen enough to create frequent, even daily, challenges for coastal communities. Nuisance floods that close streets and parks are the harbinger of things to come. In 1950, the elevation between the highest high tide and street level was many feet deep and provided headroom for a storm surge. By 2010, the sea had risen so much that the headroom was gone. In some places it takes only a slightly higher tide to flood the street. To make matters worse, climate change is accelerating the rise as heat expands the water and massive ice sheets melt into the sea. Some places are especially threatened. Chesapeake Bay is rising faster than the open coast. 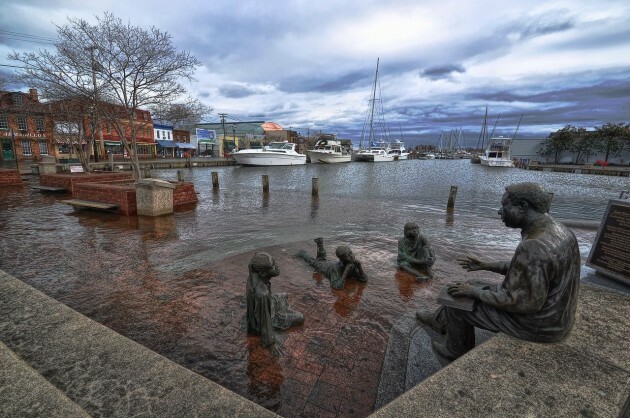 At Annapolis, Maryland the water is rising 3.51mm/year with just 0.29 meters of headroom. In only 45 years they can expect daily floods at the city dock, shown above. Baltimore is not far behind. Sadly, Florida and North Carolina both experience frequent flooding but have forbidden state employees from talking about it. (Florida last year and North Carolina in 2012). They’re losing precious time. Yes, the sea is rising. Time and tide wait for no man. p.s. Read more about Maryland’s wet future and the expected loss of Blackwater NWR and Assateague Island in “The Sea Also Rises” in Baltimore Magazine. Click here for photos of nuisance flooding in Miami, Florida and North Carolina. The Sea Around Us was my very influential intro to Rachel Carson, and I forgot that she was already warning about the rising seas. It’s very dispiriting that state employees are being silenced, and Blackwater and Assateague are threatened within the lifetimes of many now living. The acceleration from positive feedback mechanisms was expected, but still it really hits home when these treasures could be gone forever. My goodness … I didn’t realize Rachel Carson had foretold of rising seas, way back in 1950. Yet, sadly, not much changes with regard to “doing something about it.” Every major storm seems to bring horror stories of flooding, except for us in California, where we continue to experience drought. Wonder what the world will look like in 2050?